CLEVELAND, OH - No. 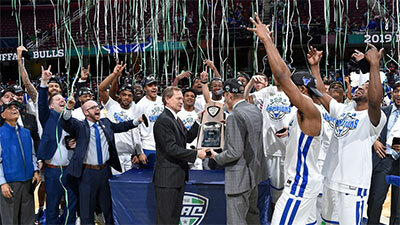 1 seed Buffalo won the MAC Championship for the fourth time in the last five years with a 87-73 win over No. 3 Bowling Green in the MAC Men's Basketball Tournament Championship Game, presented by Visit Myrtle Beach, on Saturday, March 16 at Quicken Loans Arena. Buffalo jumped out to an early lead and took its largest lead of the half with a 15 point advantage with a 28-13 lead at 7:24 of the first half. Bowling Green ended the half on a 25-11 run to cut the Buffalo lead to 39-38 at the half. Bowling Green's Justin Turner (6'4''-G-98) opened the second half with a three-pointer to give the Falcons its first lead of the game, 41-39. Both teams traded leads in the second half as the largest lead for either team was only three points through the 6:46 mark left in regulation when Buffalo's Jayvon Graves three pointer gave the Bulls a 69-65 lead. Buffalo was led by Harris with 31 points, Graves posted 17 points, while senior CJ Massinburg (6'3''-G-97) added 16 points. Bowling Green was led by Turner with 16 points, sophomore forward Daeqwon Plowden (6'6''-G/F) with 16 points, while senior forward Demajeo Wiggins (6'10''-F-97) added 14 points. G: Jaylin Walker (6'1''-G-97) of Kent St.
G: Tayler Persons (6'3''-G-95) of Ball St.
G: Anthony Roberts (6'4''-G) of Kent St.